We made it! Some of you may remember our catastrophe trying to get to Georgia in July, so when we all woke up feeling healthy on September 4, we counted it as a miracle. One five hour plane ride and a two hour drive later, we got to see Justin and Marie for the first time in three and a half years! It was great to finally see them and meet their adorable baby, Mckenzie. Mckenzie has huge brown eyes that seem to absorb everything. It was fun to hold a cuddly little featherweight baby for a while instead of my big squirmy one. We enjoyed a relaxing couple of days in Warner Robins catching up. 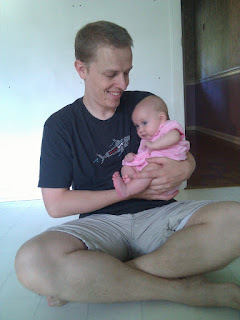 Jared was interested in his cousin as long as she let him pull on her ears, poke her experimentally, and do everything possible to get his hands on her pacifier. Jared only likes a pacifier when he is tired, but he was hit with jet lag pretty seriously. Unfortunately for Justin and Marie, we learned that a very tired Jared screams uncontrollably at all sleeping times. When we finally figured out when his sleeping times would be, his eating times weren't on the same schedule, so sleep would be interrupted by hunger. We still managed to have a great time, even though it was too short. 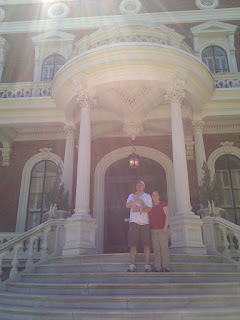 We went to church and met some of Justin and Marie's friends, went out on Monday for southern barbecue, and went to Macon to see some of the antebellum homes. They were lovely on the outside. Too bad we didn't know that historical sites aren't open on Mondays in Macon. It was a very hot, muggy day, so we were happy to get our red faced babies out of the heat and home for a relaxing, air conditioned afternoon. Doesn't Todd look sweet with this little pink bundle? 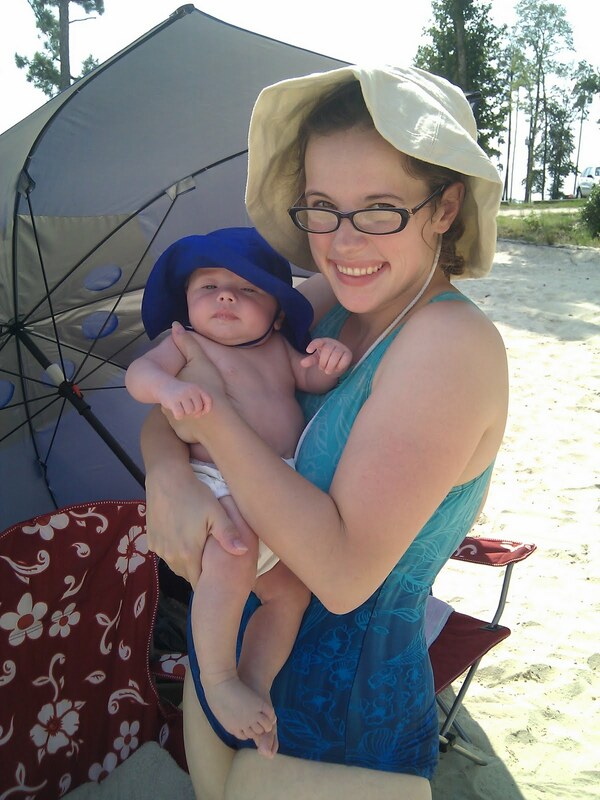 Next time we see Mckenzie she will be much bigger. Have you ever thought of moving to a more moderate climate, Justin and Marie? There's room in California! 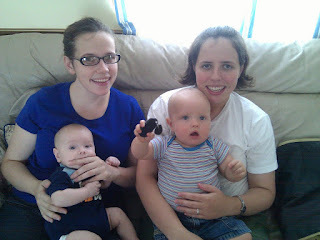 The other Knights had to go back to work on Tuesday, so we headed to Cochran to meet Jared's other new cousin, Aaron. Aaron is an incredibly lively three month old (he wasn't quite three months old then) who can roll over and scoot across the floor already. 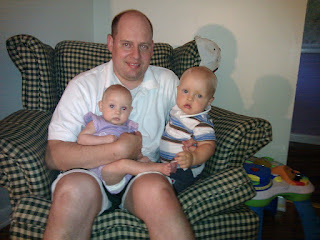 It was also great to see Cheyenne and Andrew. We wish Andrew had been able to be around more. He was busy in school and with the army most of the time we were there. It was an eventful week with Cheyenne, as usual. On Wednesday she took us to play in Lake Tobesofkee. 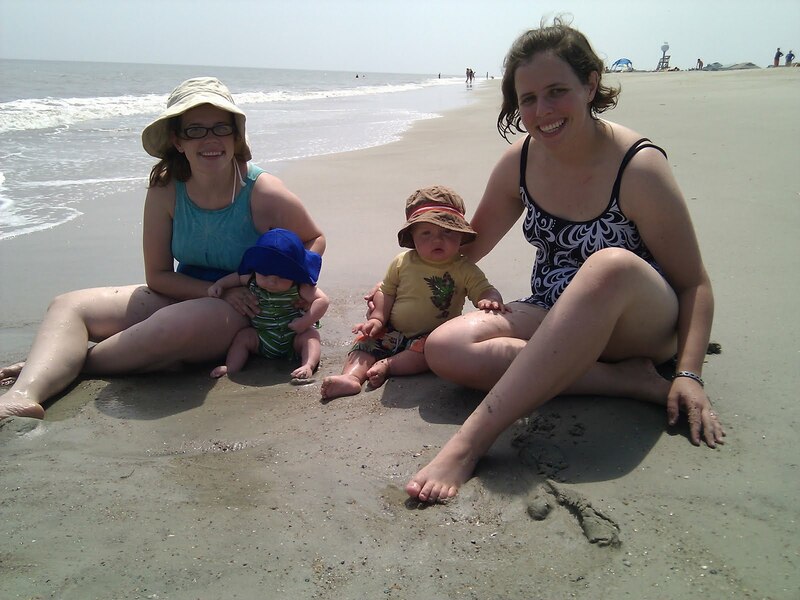 We had most of the beach to ourselves. Jared loved the warm, still water. He wasn't bothered by the hundreds of little fish swimming around his ankles. 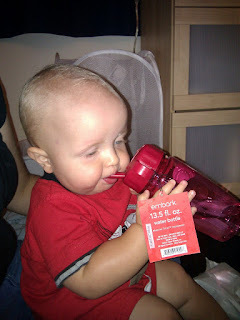 Aaron is also a little water lover, so we all had a great time in spite of the oppressive heat. 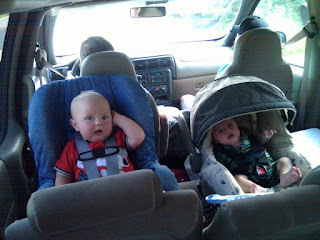 When we left the lake, we met Andrew and drove to Forsyth to meet my Uncle Fred for dinner. He lives in South Carolina, but he was in Atlanta for some work training, so we couldn't miss the chance to see him. In Forsyth I changed my very first cloth diaper without any supervision. I'm a pro. It was fun to see Uncle Fred again. He pronounced Jared's head as peach-like as ever. Jared and Aaron were surprisingly interactive. They could make each other laugh (or cry) riding in their parallel car seats. It didn't take Jared long to start talking about the "bah-bai" baby. He even woke up one morning calling for the baby before mom and dad. Thursday was our relaxing day. 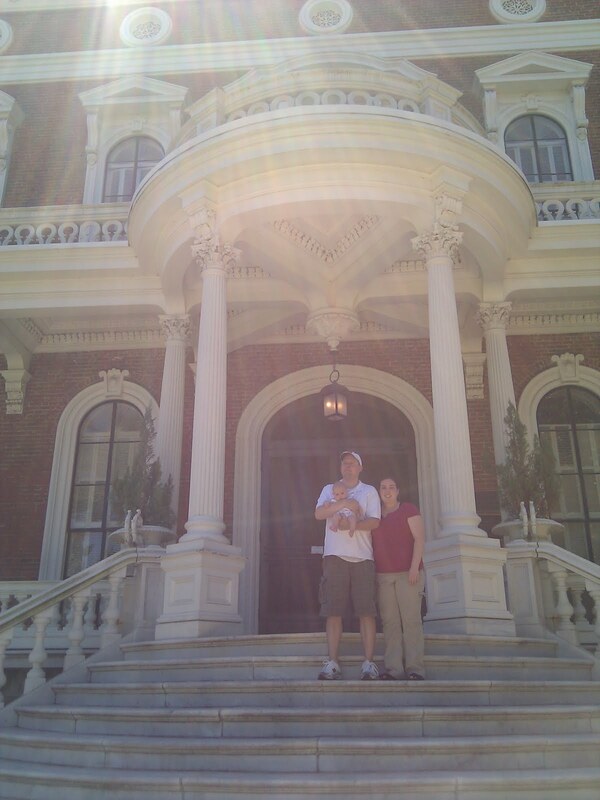 Cheyenne took us to meet Aaron's Great-Granddaddy Warnock and her employer, Mr. Lewis. When we got back to Cheyenne's house and put the babies down for a nap, Cheyenne went to use the bathroom and discovered an unexpected guest in the toilet. Somehow a frog, now affectionately known as Monsieur Pu-Pu, had gotten into the toilet. All of my childhood nightmares about a snake coming out of the pipes were revived immediately. We managed to rescue the frog from the toilet and throw him into a neighbor's pond to live out his days until he is eaten by a large fish, or, as Todd predicted, a gator. You can read Cheyenne's account of our rescue here. On Friday we went to Savannah. I had never been there, so we decided it was time. 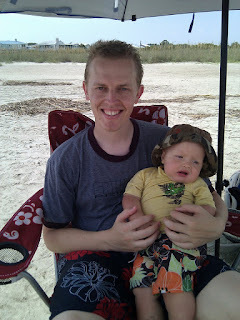 First we went to the beach on Tybee Island. 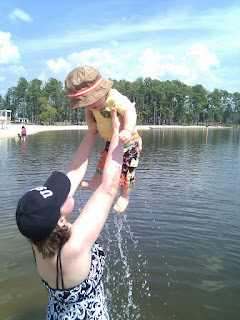 Our little water babies (including Todd, who splashes and plays in waves like he has never seen an ocean before) were having so much fun that we spent most of the day there. 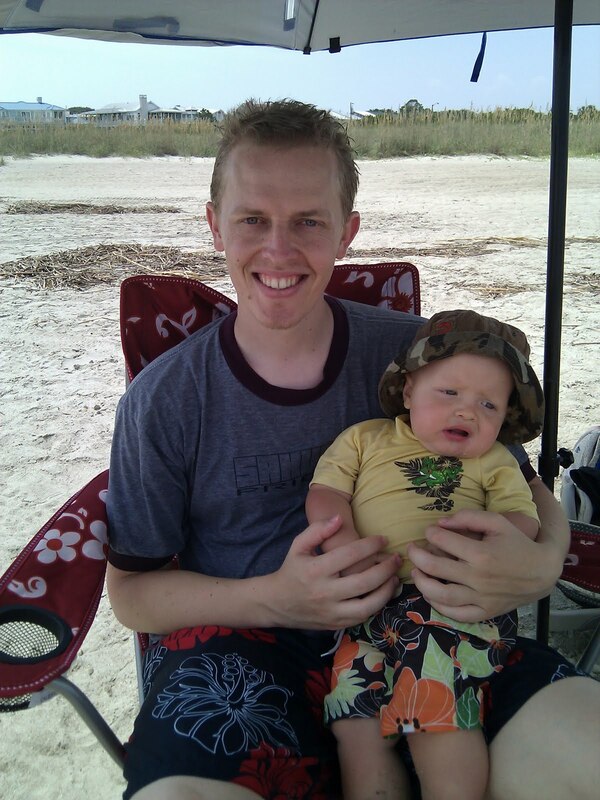 For the first time in his life, Jared didn't eat any sand. He swallowed plenty of water and ate enough peanut butter and jelly sandwiches for a child of four, but he didn't eat the sand. When did our baby turn into a little boy? 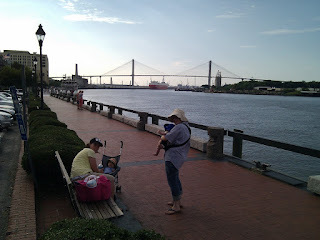 When we left the beach after naps, we drove to historic River Street in Savannah where we ate ice cream, sampled pralines, and learned a little about the history of Savannah on the Savannah riverfront. It was a long day, but we had a really great time. Thanks, Cheyenne, for sacrificing sleep and going to a lot of trouble to make our trip exciting and fun. Thanks also to Mr. Terry, Miss Gay, and the whole Warnock family for letting us stay with you and making us feel like part of your amazing family. On the way back to the airport on Saturday, we met Justin in Macon for lunch. I don't know how everyone in the south doesn't weigh 300 lbs. with all of the good food available. Todd managed to get through the whole trip without being forced to sample boiled peanuts or sweet potato pie, so we will certainly be back soon. We love you, Georgia family! Thanks for an amazing trip. On August 21, 2010, Jared turned one. This means that it has only been one year since he came into our family! It feels like we have known him forever. I could go on and on about how much has changed this year, but anyone who has been following our posts knows that already. Jared is emerging from babyhood as an independent crawler who talks and sings and plays constantly. 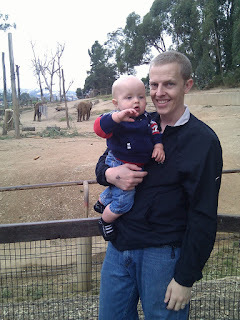 To celebrate Jared's birthday, we took him to the Oakland zoo. He had a great time people watching. We think he saw some of the animals, too. 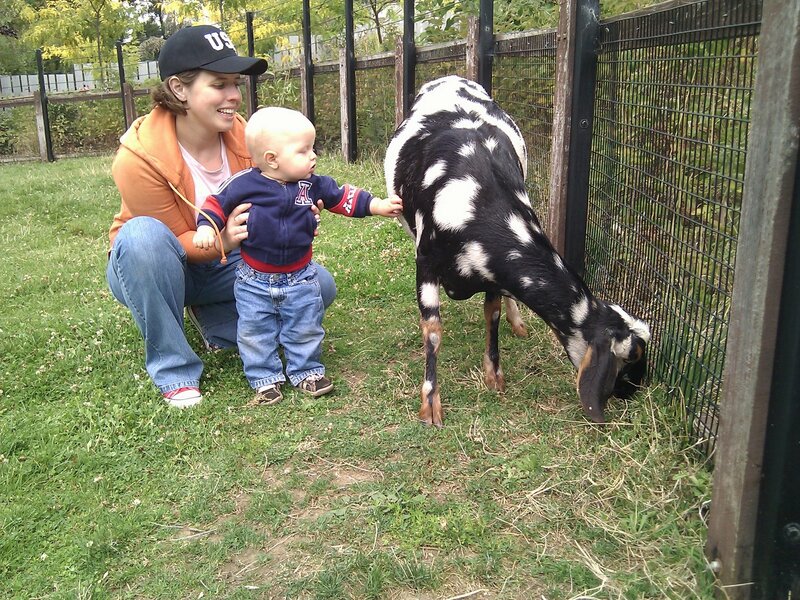 The Oakland zoo has a great children's area with play structures and an area where you can pet goats and sheep. Jared was fearless petting goats. We have an idea that he was fearless because he thought he was petting dogs. 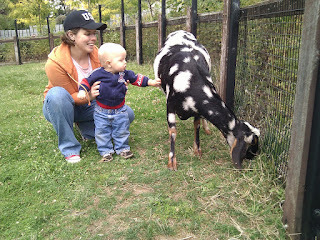 The whole time we were in the goat area he kept repeating, "Bow-wow-wow!" 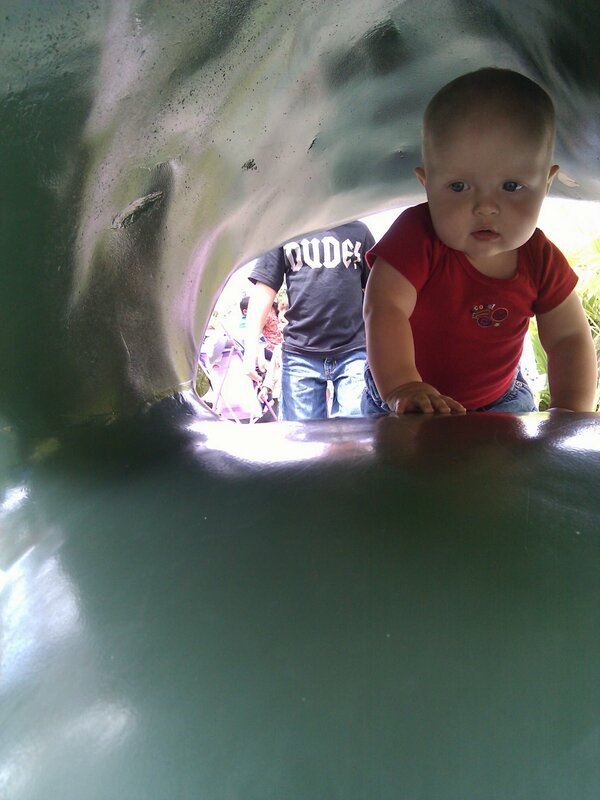 Here is the birthday boy inside a play turtle shell. "Turtle" is one of the words he says, but he wasn't too excited to be one. After our trip to the zoo, we went to the temple, where Jared got to play with some friends we ran into there. 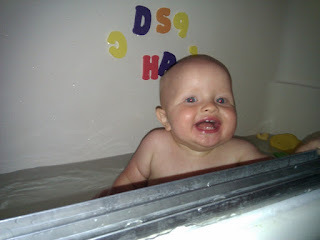 Then we went home for the birthday bath. 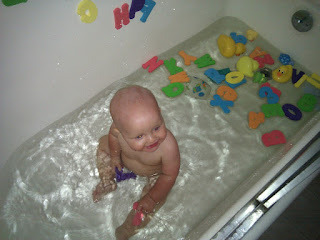 We put him in the tub with all of his bath toys. He could not have been more excited. When we were trying to decide what to do for Jared's birthday that he would enjoy, we considered just giving him three baths. This boy LOVES water. He loves drinking water, splashing in it, pulling his slippery wet body around in the bathtub, and talking about water all day. He goes back and forth between calling it "wah-wah" and "ah-ter." For a boy who can only say about ten words meaningfully, having two for water is a sign of true obsession. 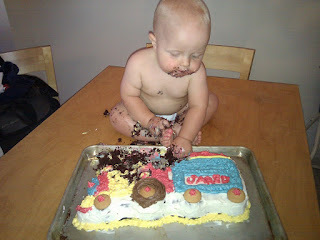 On Sunday, we gave Jared his cake. 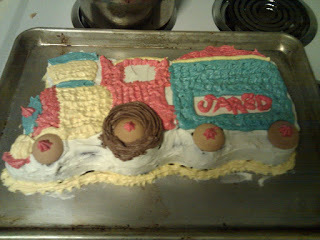 This was my first ever effort at cake decorating, so I'm willing to let a little sloppiness slide. 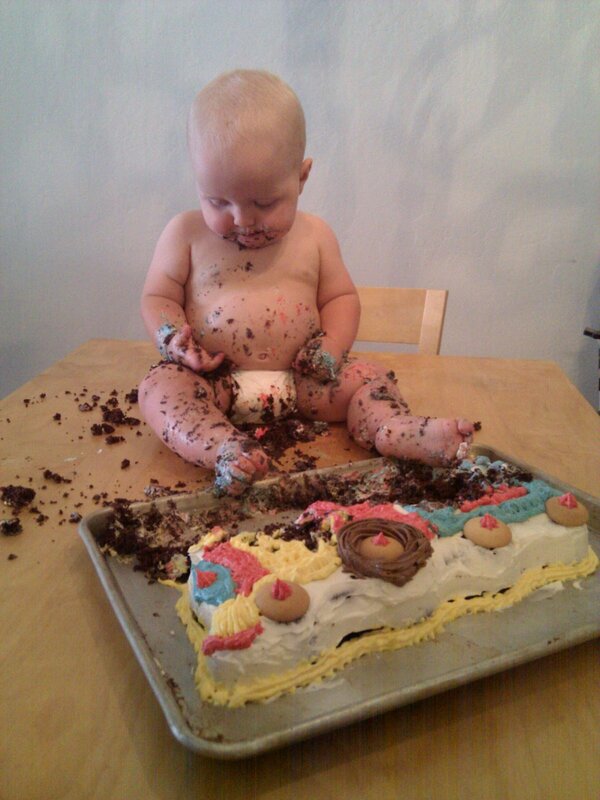 It's just going to be eaten, right? Wrong. It is going to be eaten, played with, smeared all over, squished between fingers and toes, and enjoyed as only a one year old child can enjoy a chocolate cake. When you are freed from constraints like forks and decorum, is there any limit to the possible fun? 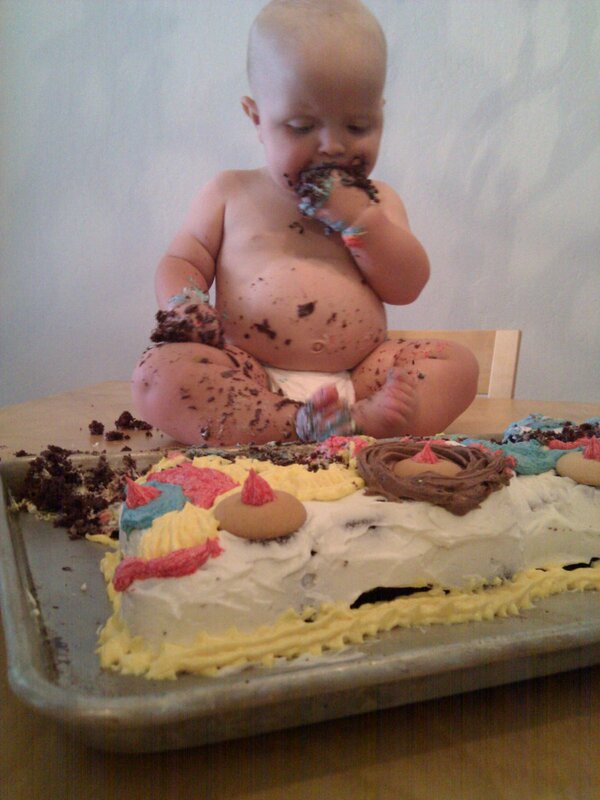 And then the sugar hit his bloodstream. He had a blast. 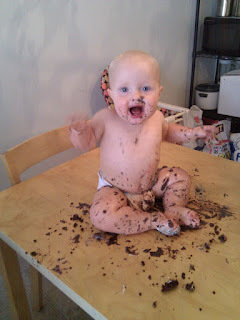 After a chocolate filled bath (the bathtub was sticky for two days), we let him open some presents. 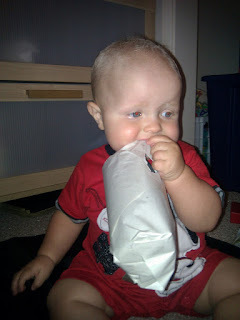 He was still a little bit more interested in eating the paper than finding out what was inside. We gave him a water bottle and some sand toys. You can probably guess what was the favorite. Our thinking with the sand toys was that they would either deter him from eating sand or teach him to use utensils. Because he was reaching the 12 month mark, Jared went to the doctor on Tuesday for four shots, a blood draw, and some measurements. He weighed 24 lbs. 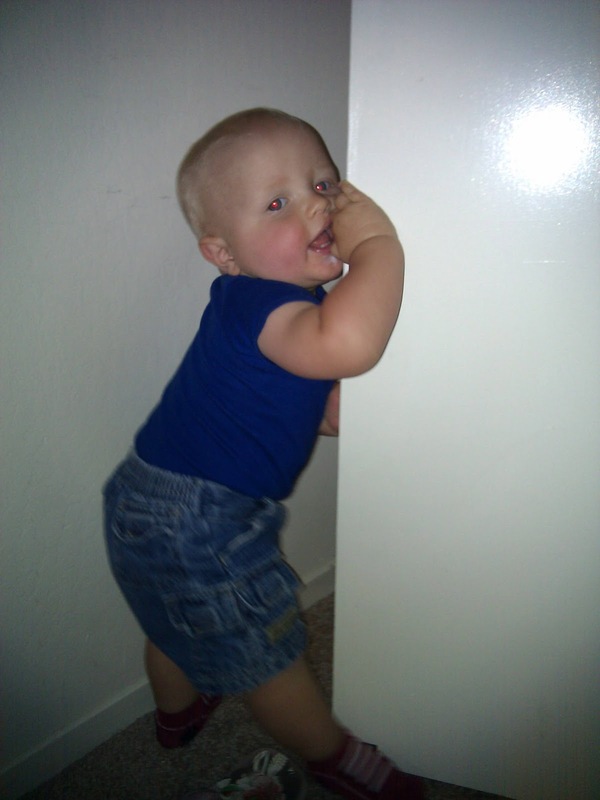 1 oz., was 29.5 inches tall, and his head circumference is 47.5 cm. These numbers put him in the 70th, 45th, and 60th percentiles respectively. Since eleven cute baby pictures is not enough for a post celebrating Jared, here is one more for the road. Happy Birthday Jared! We are glad we can't remember life without you.